Apparently circling the Duomo in Florence as part of the Feast of Corpus Christi procession earns you a plenary indulgence. I didn’t so much choose to participate as I was swept up into the crowd. 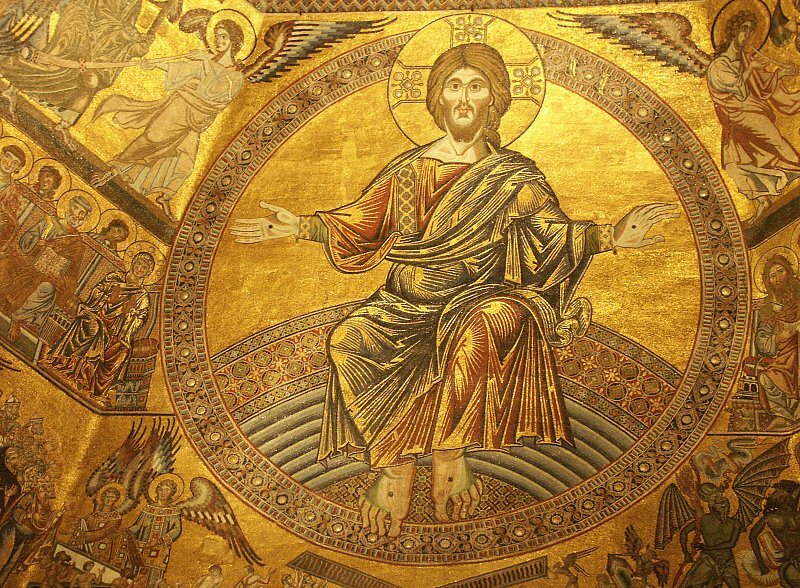 If anything, our triumphant entrance underneath the gleaming mosaics of the Baptistry was reward enough. But the nuns at the convent where I was renting a room insisted I had earned some spiritual extra credit by taking this walk, so it must be true. Looks like travel really is good for the soul! Here’s how it happened. 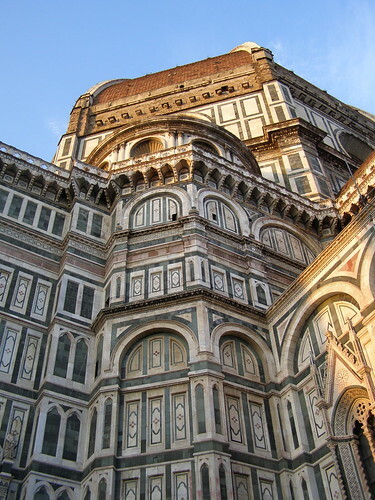 While studying art history in Florence (now over ten years ago), my friends and I went to Sunday Mass at the Duomo every week. It was both a spiritual time to pray and mediate but also a slightly selfish act since we wanted to participate with the congregation and steal a little more time to enjoy the architecture. Our first Sunday, we were selected to help bring up the gifts which meant that a very nice priest brought us into the Sacristy to pick up our items. While normally a Sacristy is just a little room to store vestments and candles, the Duomo in Florence stores relics in there. The walls were lined with glass cases of teeth, bone, and cloth fragments. While maybe not as impressive as the jeweled museum relics in the Opera della Duomo, these seemed like a secret treasure because they were hidden away from the public and we were lucky enough to see them. The next exciting Sunday was the Feast of Corpus Christi. We sat near the front as usual; although, there seemed to be a higher number of monks and nuns in attendance. The service started while tourists wandered through the periphery aisles. Prayers were punctuated by the occasional camera flash as someone attempted a futile shot of the massive dome. Halfway through, flags and ushers started organizing themselves and the rows began emptying out. We got herded into the center and I awkwardly fell in line between two cliques of nuns. We proceeded to walk outside and around the Duomo while a massive crowd of tourists looked on. I must say I felt kind of silly. I wanted to shout, “I’m only an American student! I don’t really know what’s going on!” But my friends and I went with the proverbial (and literal) flow. Circling the massive cathedral, I soaked in the grandness of the ceremony and enjoyed the bizarre feeling of being on the other side of the tourist gaze. The procession wound around to the Baptistry and I could see we are going to go through it. 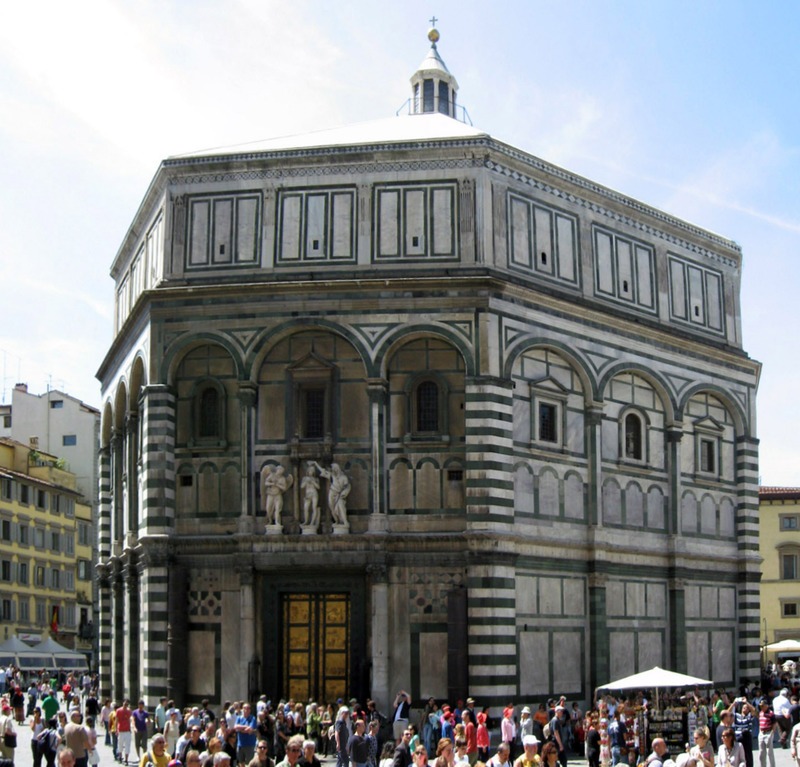 At this point in my trip, I still had not been inside the Baptistry. It kept strange hours so I had just gone to look at the famous Gilberti doors. Now, for the Feast of Corpus Christi, visitors were roped away and the full Baptistry doors were swung open for the approaching procession. Once I entered, all I could see was the gold ceiling. The intense, shining light of the tiles just captivated me. It filled my entire periphery vision like a planetarium of precious metal and gems. The Christ figure at the center of the Last Judgement scene was massive. I remember tracking him as I walked so I could look at each fold in his robes. I must have run into everyone around me because I was only looking up. While the procession did slow down to linger, we were soon back into the mid-day sunshine and then into our seats in the Duomo. That night at the convent, I tried to explain my day to the nuns. 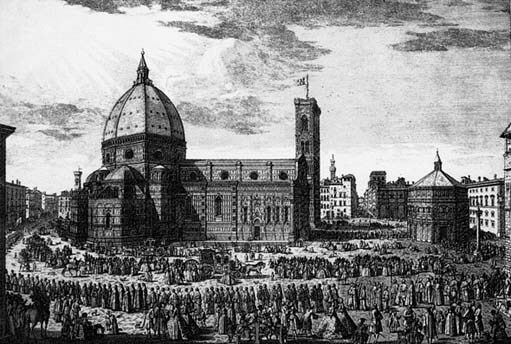 They had a framed copy of an 18th century print (above) showing a procession around the Duomo which I used as a prop. The ladies seemed quite amused by my adventure and excited to let me know it was a very good thing to walk in this procession. I did my best to let them know that sharing in the feast day tradition was definitely a blessing and reward enough for me. Thanks! haha, yeah, a little extra credit doesn’t hurt.